A doctor turned businessman who’s served since last spring on the board that oversees the three state universities is pledging his full support of tenure for professors and the free speech rights of campus protesters. “I’m a strong supporter of freedom and that includes free speech and academic freedom in and outside of the classroom or on the campus and in the community, even if that free speech or those ideas differ from my own. The First Amendment is the bedrock of our freedom,” Michael Richards, a member of the Board of Regents, said Monday afternoon. Richards has served on the board since last May. He’s a 1967 graduate of Osage High School and a graduate of the University of Iowa College of Medicine. “Last year, when there was an open Regents seat…I volunteered, so that I might give something back to the state that has given so much to me and allowed so many opportunities,” Richards said. 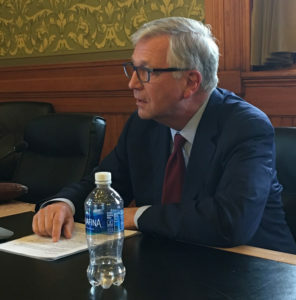 Richards’ current term on the Board of Regents expires in 2021, but he must get “yes” votes from 34 of the 50 state senators to win confirmation and remain on the board. On Monday afternoon, Richards was quizzed by members of the Iowa Senate Education Committee. Democrats on the committee asked him about bills Senate Republicans are hoping to pass and he gave careful answers. One bill would no longer let University of Iowa researchers use stem cells in their research. Richard didn’t say whether he supports or opposes that bill. Another bill essentially would get rid of the “guns free zone” designations for the three college campuses. Richards didn’t say whether he supports the idea of letting people legally carry concealed weapons on the campuses, but he did tell legislators the Regents and the university presidents, rather than legislators, should make that decision. The current president of the Board of Regents is leaving the board when his term expires in two months. Richards does not want that job. Richards, who lives in West Des Moines, is currently the managing partner of a business in Orange City that makes equipment used in medical facilities and the aerospace industry.